I have a lot of love for Twin Cakes Bakery. Twin Cakes is run and created by my favourite twins and healthy living superstars Lori and Michelle from Pure2Raw. Lori and Michelle are both certified raw vegan chefs with a passion for healthy living and a knack for making healthy food taste delicious. Their own digestive and health issues drove them to start creating recipes for their "Super Natural" diet and create food better than what was available on the market. They create the best raw food that I have ever tasted, and I have no doubt they will only become increasingly popular due to the quality of their product. Here are some their treats that I recently tried and loved! The biscotti is one of my favourite Twin Cakes treats! It's perfect to enjoy with your morning cup of coffee or afternoon tea. I love being able to indulge in one of my top sweet treats without getting a sugar high (followed by an energy low). The cashew coconut is sweet, indulgent and puts Larabars to shame! I'm obsessed with the cardamom biscotti as well. I honestly think of it as one of the best things I've ever eaten. Key Benefits: • Cashews are a great source of protein, copper, magnesium, and phosphorous. • Coconut flakes are a medium-chain triglycerides, which is a great source of energy, and full of fiber. • Sweetened with unprocessed sugars. A wonderful blend of coconut and vanilla flavors with a richness of cashews. Chocolate and spicy food are my two of my favourite things. I don't always like them together but these snack bites are the perfect combo of both. They taste rich and indulgent with a hint of spice, and are so satisfying one or two bites make the perfect little dessert! Hazelnuts are full of protein, folic acid and good source of healthy fat. Antioxidant rich, full of iron and magnesium from the raw cacao. Cinnamon is a powerhouse spice that stimulates digestion, anti-inflammatory, and stabilizes blood sugar. Coconut nectar is a low glycemic sweetener. Chia seeds are full of fiber and omega 3s! Forget cookie dough. 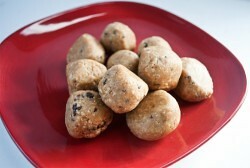 These little superfood dough balls are the next generation. You will never feel deprived with these on hand! Cashews are a great source of protein, copper, magnesium, and phosphorous. Coconut is a medium-chain triglycerides, which is a great source of energy, and full of fiber. Sweetened with unprocessed, natural low glycemic sugars. Flax meal is ground flax seeds. They are full of fiber and Omega 3s. Ingredients: organic coconut nectar, organic carob powder, organic coconut butter, organic coconut oil, organic lucuma I love chocolate but I'm doomed if I eat it before bed due to the caffeine content. 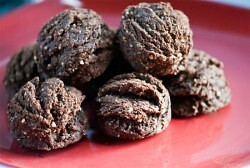 These carob balls provide the perfect late night solution! They melt in your mouth like chocolate AND do your body good. 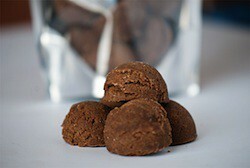 Carob chocolate-carmel like flavor without the caffeine. Great source of minerals and B-vitamins. Coconut oil contains lauric acid, a medium chain fatty acid that provides you with quick and sustained energy. It is easy to digest and helps with thyroid. Sweetened with unprocessed, natural low glycemic sugar. Ingredients: onions, organic collard greens, organic flax meal, organic tahini, organic sesame seeds, organic spices, organic sea salt This bread was perfect with my miso soup for lunch. It's hearty and filling and can be used in so many ways. You can break it up into croutons in your salad, or even top it with some tomato sauce and pizza-like toppings for a super healthy dinner! It has a strong onion flavour, which being an onion lover I really enjoyed! Collard are full of vitamins and minerals like B6, C, manganese, and iron. 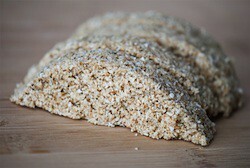 Sesame seeds are a great source of calcium. 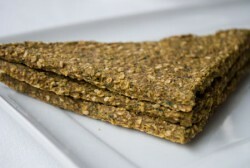 Flax meal is high in fiber and omega 3 fatty acid. The bread is alkaline forming due to the dark leafy green – collards. This is part of our ‘green’ line where we try to create delicious and healthy snacks where you can get more ‘greens’ into your diet.